Using a 2000-ton, TL15 hull, the Type-TJ Class Transport mounts jump drive-V3 and power plant-V3, giving a performance of jump-6. Fuel tankage supports a 6 parsec jump, at 200t per parsec, and 0.5 months of operations. Attached to the bridge is a Computer Model/6 std. There are 12 crew staterooms and 5 low berths. 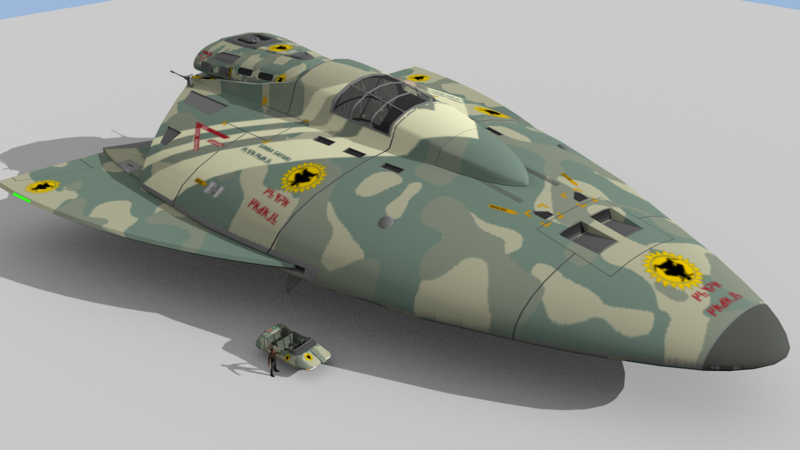 Installed weaponry include 3 T3 Missiles, 3 T3 Fusion Guns, and 4 T3 Sandcasters. The ship does have 40 tons of cargo space. The ship has a streamlined hull, with scoops for frontier refueling. Carried craft include 1 Cargo Shuttle, 1 Air/Raft Enclosed, and 1 Grapple Set Triple. 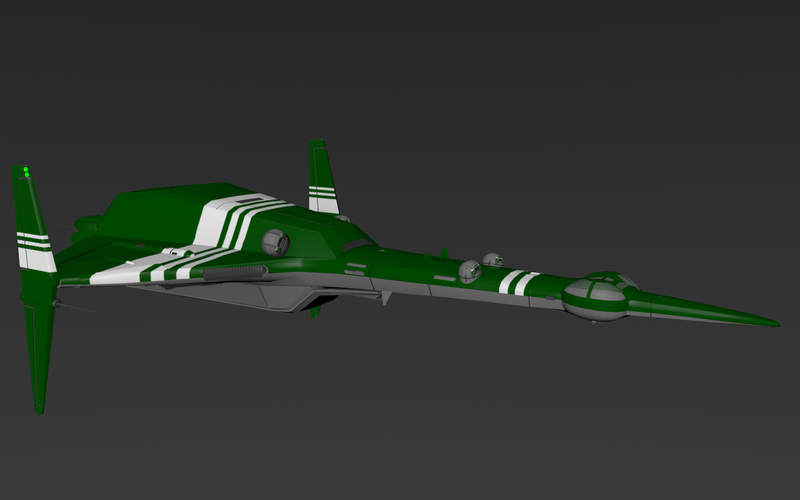 The ship has 6 crew plus gunners, flight and troops, and can carry 5 low passengers. At Jump-6 this design is essentially not possible as there is no way to fit these stats into the ship while still retaining a 300dt (4050kl) Cargo bay. My design has 36dt overtonnage to fit a 40dt cargobay inside. rediculously small I’d say. And the concept of computers seems to have changed in T5, because neither this nor the Type-TI could ever fit thre Model/9 computers ito the hull and still come close to the MT stats. Using a 2000-ton, TL15 hull, the Type-TI_v0-5 Class Transport mounts jump drive-V, maneuver drive-V, and power plant-V, giving a performance of jump-2 and 2G acceleration. Fuel tankage supports a 2 parsec jump, at 200t per parsec, and 2 months of operations. Attached to the bridge are two Computer Model/5 std. There are 12 staterooms and 5 low berths. Installed weaponry include 3 T3 Missiles, 3 T3 Fusion Guns, and 4 T3 Sandcasters. The ship does not have cargo space. 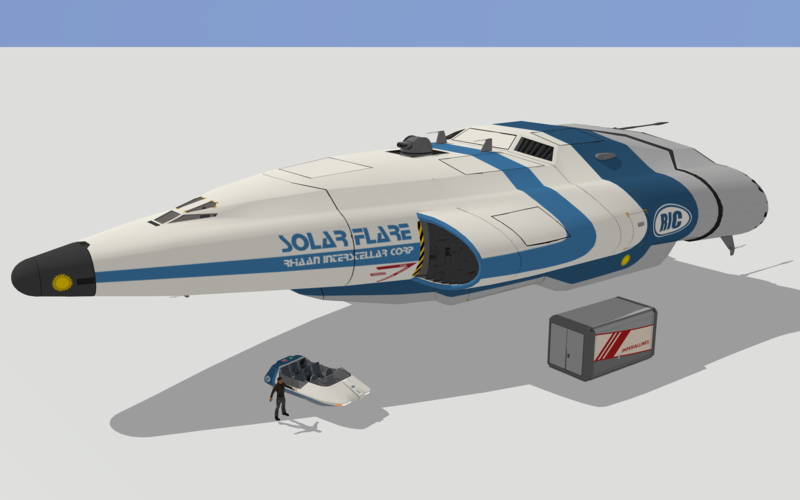 The ship has a streamlined hull, with scoops and intakes for frontier refueling. Carried craft include 1 Cargo Shuttle, 1 Air/Raft Enclosed, and 1 Grapple Set Triple. The ship has 20 crew (3 bridge crew, 2 engineers, 12 gunners, 2 auxiliary flight crew, and 1 medic) but can be technically operated by 6 crew, and can carry 5 low passengers. 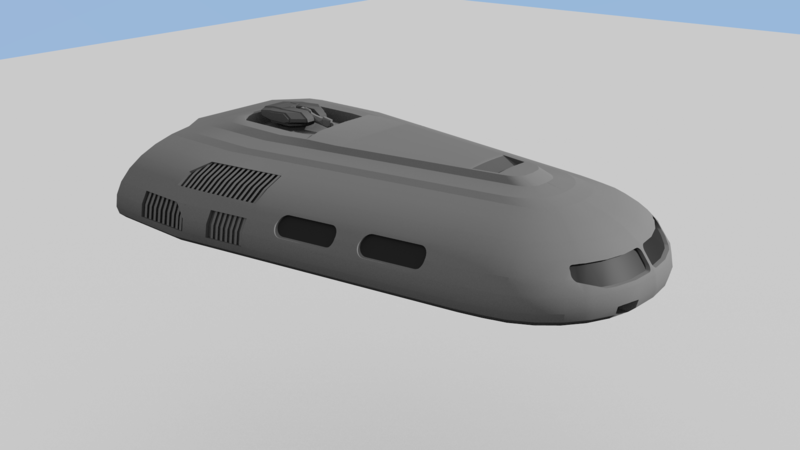 This craft is an adaption for the TI that I think is feasible IMTU, given the fact tha this is a company owned transport. The original ship had 12 Staterooms with double occupancy for all but command crew and a total crew of 20 (1 Bridge, 2 Engineer, 10 Gunnery, 2 Flight, 2 Troops, 2 Command, 1 Medic). It aso featured a nuclear damper and EM hardening. I will likely put some more work into the craft. The MT version had triple Model/9 computers which woud add about MCr 250 to the standard design. Way too much. I believe I can live with two Model/5 bis computers but it wouldn’t be the same design. The MT Type-TI in TRaveller 5 would cost nearly as much as the Type-TJ. Using a 300-ton, TL12 hull, the Star v0.4 Class Armored Merchant mounts jump drive-E, maneuver drive-B, and power plant-E, giving a performance of jump-3 and 1G acceleration. Fuel tankage supports a 3 parsec jump, at 30t per parsec, and one month of operations. Attached to the bridge is a Computer Model/2bis std. There are 13 staterooms and 10 low berths. Installed weaponry include 1 T3 Missile, and 2 T3 Beam Lasers. Cargo capacity is 46 tons. 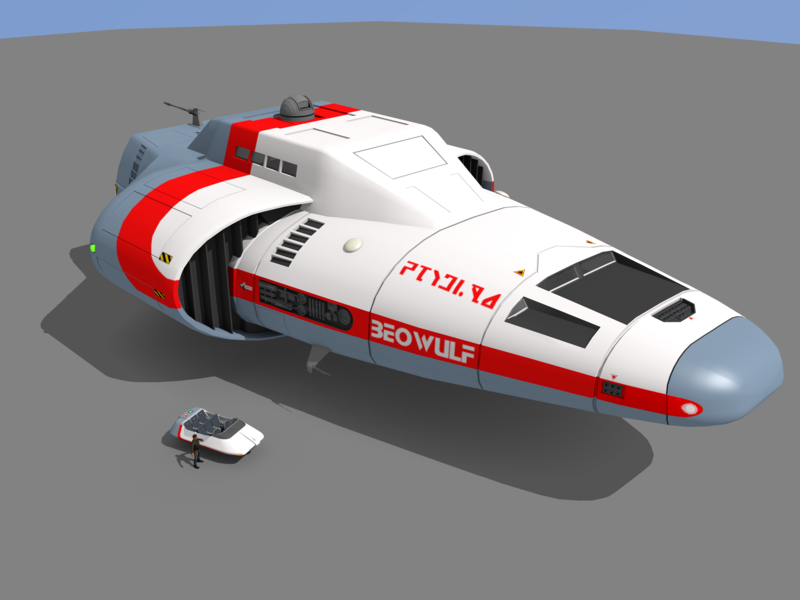 The ship has a streamlined hull, with scoops for frontier refueling. The ship carries 1 Air/Raft Enclosed. 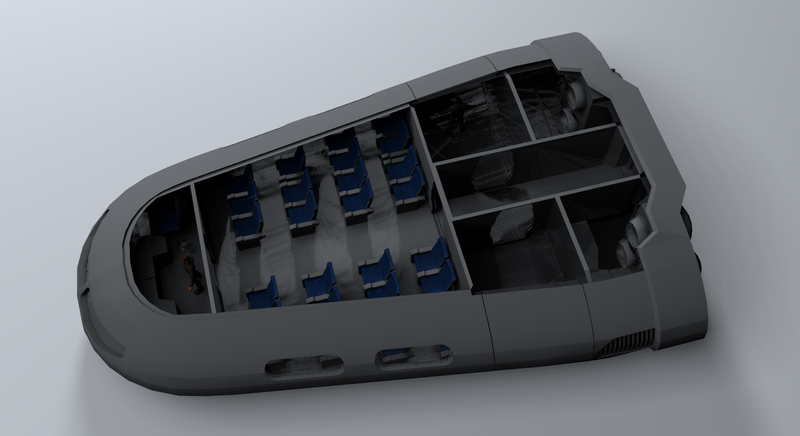 The ship has 6 crew, and can carry 8 passengers and 10 low passengers. 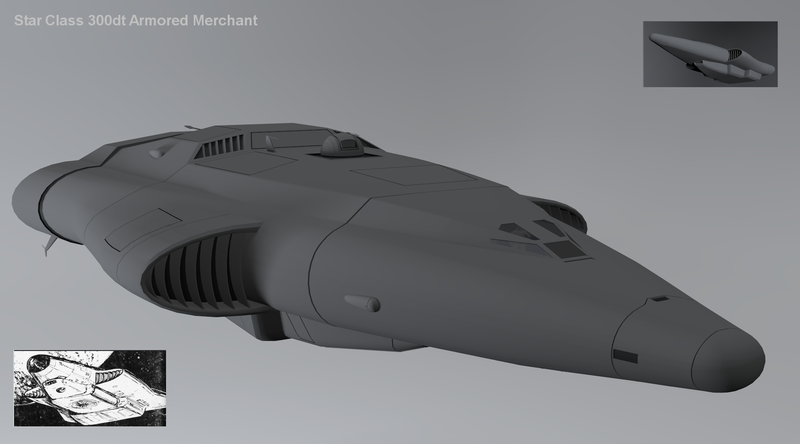 I already modeled the ship some time ago and I think it came out very nicely. 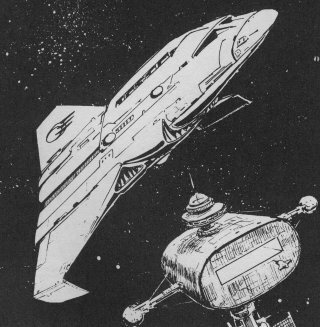 The one thing I am sure William H. Keith, Jr. would have done differently is the windows (there are Bill Kieth styled windows in a lot of Traveller starship images. 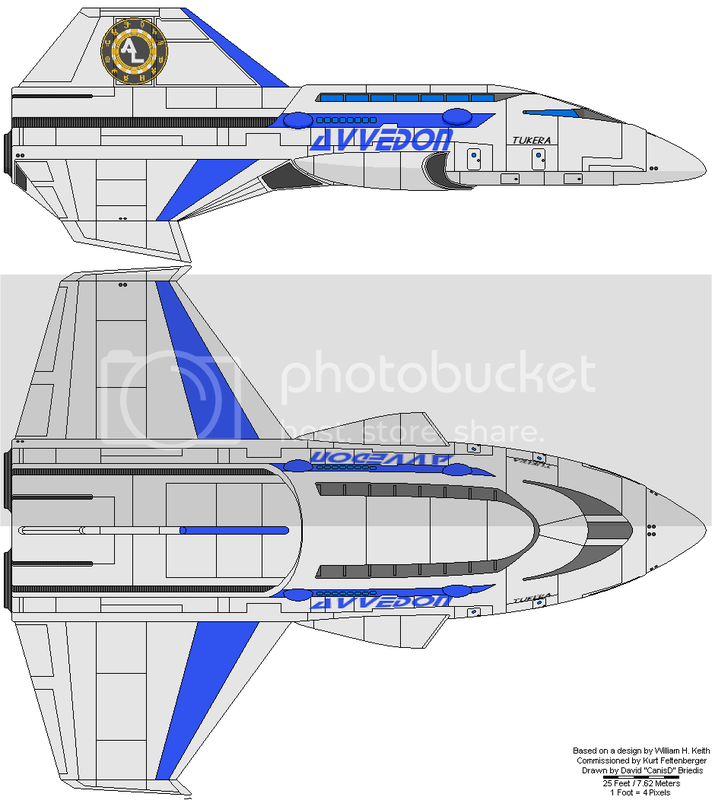 If you’re interested I made a ship with two variants, one of which depicts this style.